Years ago, Dirty Revival's lead singer worked at McMenamins Edgefield in Troutdale. Thursday will mark a homecoming for Sarah Clarke as she and the band take the stage for the Great Northwest Music Tour. 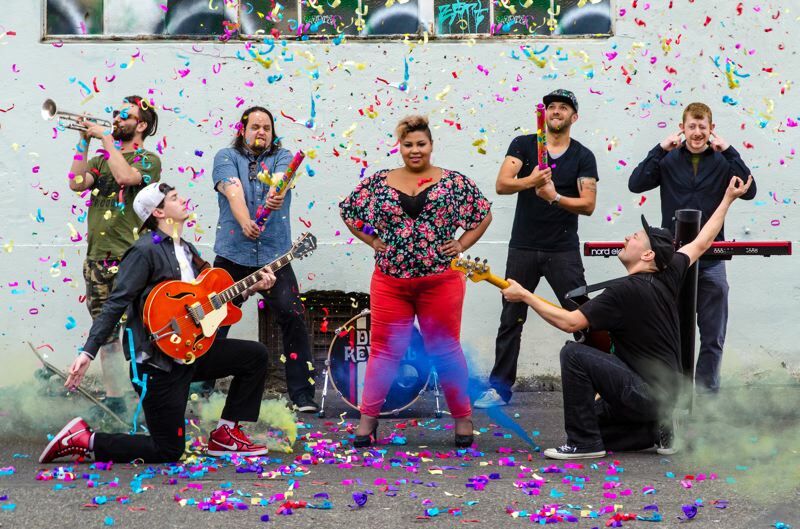 Dirty Revival will perform a free, all-ages show from 7-10 p.m. in Blackberry Hall at McMenamins Edgefield, 2126 S.W. Halsey St.
"I'm excited to see old friends and visit my old stomping grounds," Clarke, a lifelong Portlander, says. Drawing from the band's favorite genres of soul, funk, hip-hop, R&B, jazz, gospel and rock, Dirty Revival's sound has been called "big, gritty and honest." "We're very soulful, with all the instrumentation of a soul band," Clarke says. "We also love to rock, and we have players with extensive jazz backgrounds." Along with Clarke as the front woman, the septet is comprised of emcee and guitarist Evan "evv'n'flo" Simko, drummer Terry Drysdale, keyboardist Ben "Snacks" Turner, bassist Jon Shaw, tenor sax player Chris Hardin and trumpet player Thomas Barber. Four out of seven of the band members attended Grant High School in Portland together and have been close friends ever since. Clarke says there's been an instantaneous chemistry with the newest band members as well. 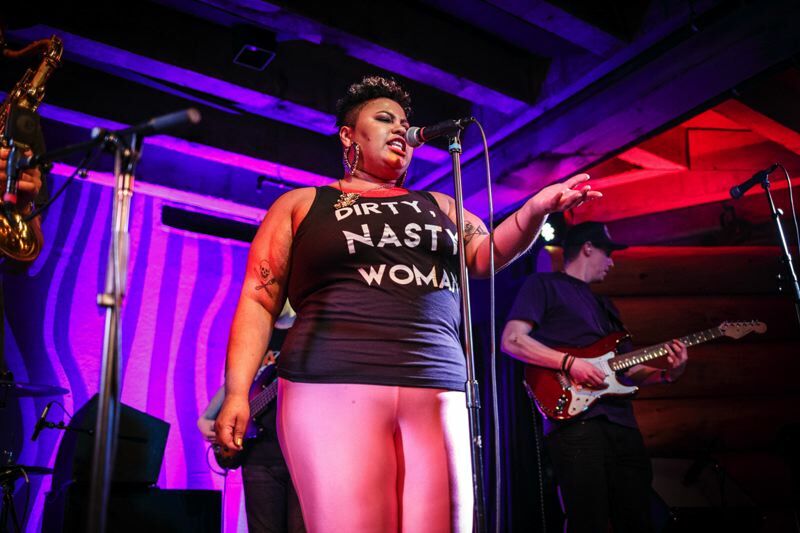 From their early years of practicing in basements and performing as a side gig, Dirty Revival band members have gone on to perform everywhere from dimly lit dive bars to crowded concert halls and open-air festivals. They've been likened to a combination of Aretha Franklin, Stevie Wonder, Earth Wind and Fire and Rose Royce all blended as one — something Clarke calls "a massive compliment that almost made her faint." The band will go on its first national tour at the end of the summer, venturing to the East Coast for the first time together. Still, Dirty Revival is rooted in the Northwest. "There are so many phenomenal artists and venues here," Clarke says. "There is such a sense of community — of artists being supportive of each other." Some of the bands' latest local inspirations include Blue Cranes, Noah Simpson and Laryssa Birdseye. They have enjoyed performing at venues such as Doug Fir, Mississippi Studios and Revolution Hall. One of Clarke's favorite parts of the music writing experience is when band members all get caught up in what they're doing and how they're going to translate the music to their instruments. Clarke says the music guides her lyrics as she draws from her own experiences and what others are experiencing around her. "Listening to each other's stories is really important — seeing what other people are going through," Clarke says. "A lot of the time the music itself takes me on a ride to tell me what it's all about." Dirty Revival's next Portland area performance will be Friday, May 11, at the Star Theater, with Con Brio and The Lique. The band looks forward to bringing its sound to East Multnomah County Thursday. "It's going to be so cool to be back at McMenamins," Clarke says. "It's going to be an awesome homecoming." The Great Northwest Music Tour is a longtime McMenamins tradition. With an early start time, family friendly setting and no admission charge, the tour has become a way to catch both rising acts and longtime favorites such as Dirty Revival.